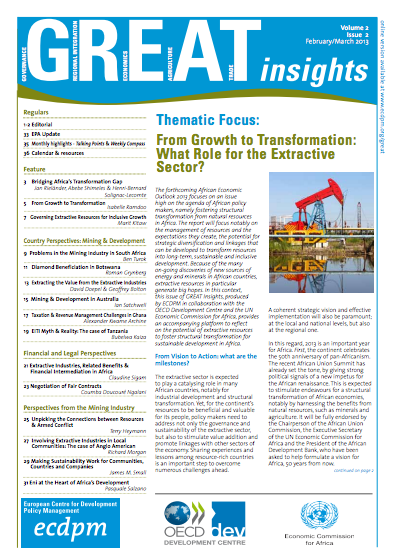 ECDPMGreat Insights magazineEditorial: From Growth to Transformation – What Role for the Extractive Sector? 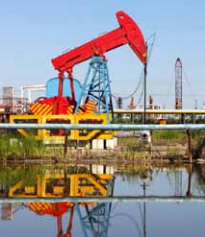 Editorial: From Growth to Transformation – What Role for the Extractive Sector? The forthcoming African Economic Outlook 2013 focuses on an issue high on the agenda of African policy makers, namely fostering structural transformation from natural resources in Africa. The report will focus notably on the management of resources and the expectations they create, the potential for strategic diversification and linkages that can be developed to transform resources into long-term, sustainable and inclusive development. Because of the many on-going discoveries of new sources of energy and minerals in African countries, extractive resources in particular generate big hopes. In this context, this issue of GREAT Insights, produced by ECDPM in collaboration with the OECD Development Centre and the UN Economic Commission for Africa, provides an accompanying platform to reflect on the potential of extractive resources to foster structural transformation for sustainable development in Africa. From vision to action: What are the milestones? 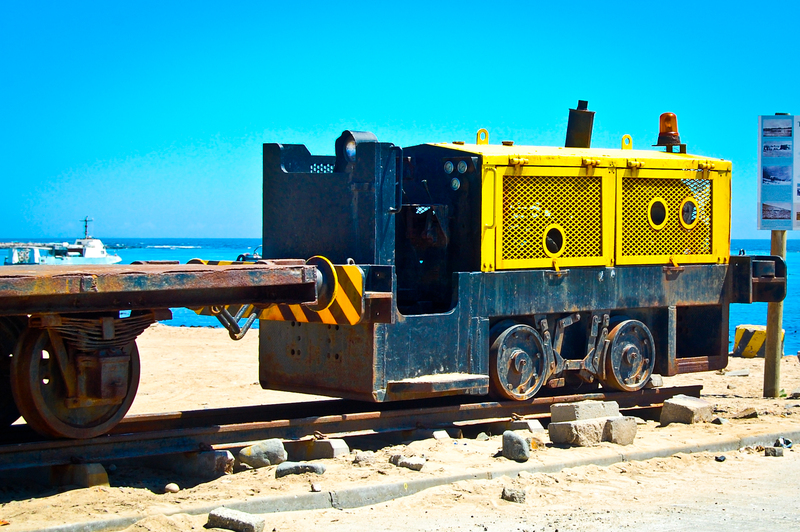 The extractive sector is expected to play a catalysing role in many African countries, notably for industrial development and structural transformation. Yet, for the continent’s resources to be beneficial and valuable for its people, policy makers need to address not only the governance and sustainability of the extractive sector, but also to stimulate value addition and promote linkages with other sectors of the economy. Sharing experiences and lessons among resource-rich countries is an important step to overcome numerous challenges ahead. A coherent strategic vision and effective implementation will also be paramount; at the local and national levels, but also at the regional one. In this regard, 2013 is an important year for Africa. First, the continent celebrates the 50th anniversary of pan-Africanism. The recent African Union Summit has already set the tone, by giving strong political signals of a new impetus for the African renaissance. This is expected to stimulate endeavours for a structural transformation of African economies, notably by harnessing the benefits from natural resources, such as minerals and agriculture. It will be fully endorsed by the Chairperson of the African Union Commission, the Executive Secretary of the UN Economic Commission for Africa and the President of African Development Bank, who have been asked to help formulate a vision for Africa, 50 years from now. Secondly, Africa’s evolving discourse on the post-2015 development agenda puts the continent’s interests and priorities first, anchored in the understanding that its enormous potential and endowments, including mineral resources, have to be harnessed in order to turn the growth of the last decade into sustainable transformation. There is growing understanding that mineral resources need to play an important role in the development efforts of the continent. This is widely reflected in several initiatives and strategic documents. The Africa Mining Vision (AMV) provides the continental framework and support to achieve this objective, and an African Minerals Development Centre (AMDC) will be officially established in 2013. This is a reason to celebrate because, for the first time, the continent will endow itself with a one-stop facility to support the implementation of the AMV. Similarly, the African Minerals Skills Initiative (AMSI), an integrated Private-Public Partnership strategy, will focus on skills development, beyond the mining sector, by promoting innovative approaches to capacity development, helping countries mainstream the AMV, develop their own mining visions, and strengthen planning, especially for resource corridor development. A key focus area of the AMSI will be to strengthen the capacity of African entrepreneurs to enter minerals value chains: without an indigenous entrepreneurial class that can harness the opportunities to develop value chains, there will be leakages and only minimal wealth will be retained from the extractive sector. Finally, at the national level, booming economies are rethinking their fundamentals, notably by designing policies to move from growth to long-term and inclusive transformation, using their natural resources as a lever. To ensure coordination and coherence, the AMDC will assist countries in mainstreaming the AMV at the national level, by supporting the formulation of country mining vision, in line with broader goals, interests and objectives. All those efforts would amount to little without an African governance framework to monitor progress in implementing the AMV and achieving the objectives of the AMDC. More importantly, such framework should help generate robust social compacts at the national level by facilitating the alignment of stakeholders’ understanding on mineral benefits and managing expectations better. The African Peer Review Mechanism (APRM) assumes a renewed importance in this regard: it is the ideal governance framework for linking institutional issues around fiscal regimes and mineral resources to strengthen transparency and domestic accountability to citizens. Promoting an effective and transparent management of resources, and of the expectations they create, remains a formidable challenge. Security issues in the Sahel region, political instability in North Africa and recent conflicts in Central and West Africa severely impede structural transformation. 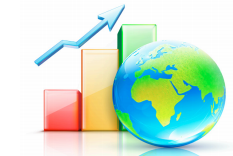 Global economic prospects are still relatively bleak and the crisis in Europe and in the US continues to unfold. Furthermore, the world, and Africa in particular, is not immune to the risk of a commodity price bubble burst. Addressing the impacts of such shocks requires strong, concerted efforts by countries themselves, using fully their regional and continental mechanisms. They must also be supported by the international community and external partners. Indeed, promoting sustainable development in the minerals sector is a joint responsibility of home and host countries, shareholders and civil society organisations, captains of industry and mine workers, as well as politicians and ordinary citizens. The success of a long-term, inclusive transformation will depend on three Ps: policies, political processes and partnerships. At the policy level, a coordinated and integrated value chain approach to mineral resource development is necessary at all levels. It is therefore important to move away from a too common narrow approach, which considers the extractive sector as an enclave in the economy, towards a more comprehensive one, which focuses on the linkages with local businesses and other non-extractive economic sectors. New institutional frameworks that promote inter-departmental collaboration and policy coherence are necessary, and mineral policy must be linked with industrial, trade and educational policies. At the political level, while leadership is key, the interests of a few must be decoupled from the broader collective interest in economic transformation. Indeed, the twisted relationship between rents and politics can lead to counter-productive outcomes. Coalitions at the national, regional and international levels can help counter those. The APRM provides the platform for dialogue and alignment of interests. Finally, efforts to build partnerships in support of Africa’s aspirational goals in the extractive sector have to be based on a common understanding of challenges and opportunities. The strategic alliances to realise the Vision will not stem from a donor-recipient relationship; rather, they need to be based on trust, mutual interest and equality among the parties involved. Engaging partners in a constructive dialogue is therefore essential to moving the agenda forward. San Bilal is Head of the Economic Governance Programme at ECDPM. Isabelle Ramdoo is Policy Officer Trade & Economic Governance at ECDPM. Henri-Bernard Solignac-Lecomte is Head of Unit in the Africa Desk of the OECD Development Centre. Antonio M.A. Pedro is the Director of the Sub-regional Office for Eastern Africa at UNECA. Go back to the table of contents.